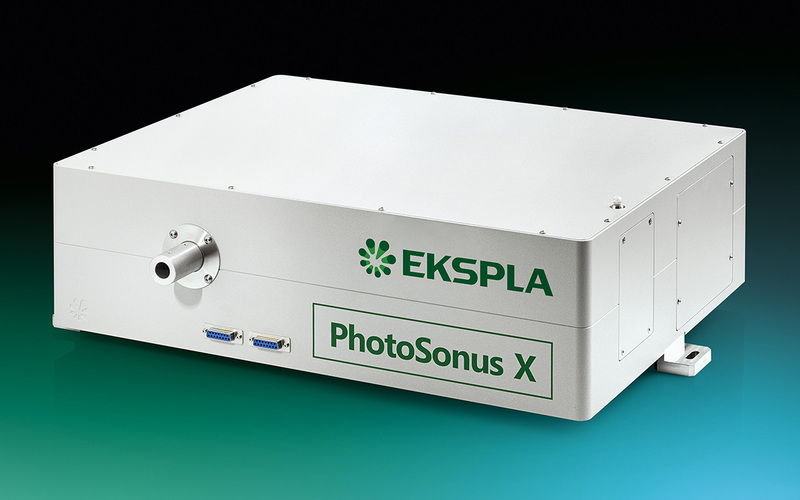 PhotoSonus X is a perfect solution for photoacoustic imaging. It has high output energy of more than 50 mJ at the peak in a broad wavelength tuning range from 650 to 2600 nm. It operates at 100 Hz pulse repetition rate. This set of parameters is perfect choice for gaining good photoacoustic signal strength and ensuring high data collection rate. Diode pumped laser technology and well-engineered system design ensures reliability and low-cost system maintenance. PhotoSonus X has fiber bundle connector with safety interlock. Bundle connector adapter and beam size are adapted to fiber bundle input ferule dimensions. PhotoSonus X can be certified for clinical photoacoustic applications. System comes with one-year warranty. Inquire for other pulse repetition rates. FWHM measured with photodiode featuring 1 ns rise time and 300 MHz bandwidth oscilloscope. Beam diameter is measured at 800 nm at the FWHM level and can vary depending on the pump pulse energy.